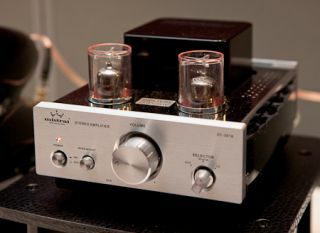 Manchester Show 2011: Mistral valve amplifiers shine | What Hi-Fi? We love a bit of valve-amp action, so were delighted to spot these beauties on Mistral Audio's stand here at Manchester. The little box above is the DT-307A hybrid valve amplifier, a 25W-per-channel model with both RCA phono inputs plus a USB connection for iPods/iPhones. The Mistral DT-307A measures a compact 17x23x13cm, and has a silver/black brushed-aluminium finish. It costs £285, and is available with or without the matching DT-307S speakers, which cost £169/pair. If you want more musical muscle, Mistral's MT-34 appears to offer it. It's a 35W-per-channel valve amplifier complete with heavy-duty torodial power transformer, solid-state rectifiers and oversized Raytheon capacitors for high volvage. The MT-34, which has two sets of RCA phono inputs, comes in a piano-gloss finish and measures 20x33x46cm. It can be used with or without its grille (see below). The MT-34 is available now, priced £799. We hope to review the new Mistral amps soon.